Athens Pride – kiss me everywhere! 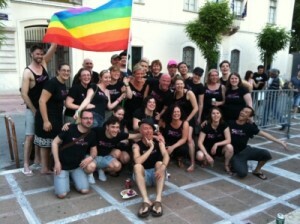 The Pink Singers had the privilege of being invited to Athens to help celebrate lesbian, gay, bi and trans Pride 2011 with them. We were excited to be going, but little did we know just how thrilling 4 and 5 June would turn out to be. The organizers and the people of Athens made us feel especially welcome, and the thunderstorms quickly gave way to sunshine and the sounds of celebration. Here’s a quick video of that amazing weekend. In keeping with the Athens Pride tagline, “Φίλα Με Παντού”! Previous Previous post: Iconic gay and lesbian songs – our choice!